Lord Shades is a French band founded in 2001. Initially, it was a one man project, managed by the current singer and bass player Alex that was the mastermind behind the band´s music, sometimes accompanied by occasional collaborators. Such situation lasted during the demo era, and as soon as the band started to release full albums, new members were added to the band´s line-up. This four-piece line-up has been rather stable during the release of their three albums. 'The Uprising of Namwell' is their last one which closes the trilogy of works based on a fictional universe created by the band members. The storyline of those works covers three different worlds. Firë-Enmek, the land of mortals and a land of suffering, Namwell which is a land of bliss and harmony and Meldral-Nok, a cursed land where only chaos and fire prevail. In this last chapter the main character, Lord Shades, has turned to the dark side and though he has become an evil creature, he is still haunted by almost forgotten memories of his previous life. This is by far the darkest and most chaotic chapter of the trilogy and the concept behind the new album. Taking into account this background, it can guess that the music included in this release must be something dark and epic, but in this occasion variety plays a major role. 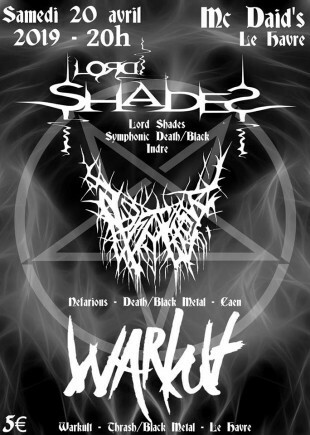 This is not a standard extreme metal album with an interesting concept behind, mainly because Lord Shades tries to combine different styles, like black, death and symphonic metal, even with certain thrash metal influences to make this complex trilogy a reality. The mixture makes this album an interesting beast, that requires a certain amount of listenings before fully appreciating it. Each song has its peculiar touch, and this can be confusing if you don’t listen to it with an open mind. Anyway, 'The Uprising of Namwell' has a general darker tone than the usual conceptual album with an epic story behind. The last part of this trilogy shows a dark world hit by violence and cruelty, so don´t expect “happy” epic arrangements. A good example of this idea would be the track “Woe to the (Vae Solis)”, which has the aforementioned dark and even decadent atmosphere. This doesn´t mean that this album lacks of beautiful arrangements, because this track is a good example of how Lord Shades successfully introduces atmospheric touches (female vocals and symphonic arrangements), which are a clear contrast to the general tone of track. This gives an extra point of unexpectedness, which is always great. On the other hand, songs like “The Revenge of Namwell” and “Nightly Visions" have a clear stronger tone with a massive death metal influence and they are probably the heaviest tracks of this conceptual work. Regarding the arrangements, the release is very rich in details and the range is quite wide. Those arrangements are usually symphonic-esque, but at certain times they can have a clear folk/ritual tone as it happens with “The Awakening”, which sounds quite close to Middle-East traditional folk music. At the end, the best way to understand the richness and diversity included here, is to check out the long and epic closing track, “A New Dawn”. This song sums up all the Lord Shades efforts in creating an authentic sonic representation of Namwell´s dark universe.